The Vampire Diaries, a tale of two vampire brothers and the beautiful girl torn between them. -The vampires feed on wild animals and humans alike, including a pet dog. -There are graphic descriptions of killing and feeding upon the kills. -A homeless person and a high school teacher are murdered. -A vampire in another century commits suicide. I thought this was a poorly written book with flat characters and predictable dialog. This is not another Twilight, but you will find nothing new and nothing original. 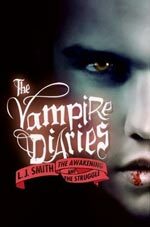 The Vampire Diaries will leave you disappointed, or worse - you'll end up reaching for another installment, hoping it will get better further on. It doesn't. Elena’s character is probably the greatest impediment to enjoyment of The Awakening because she is just so hard to empathise with. A privileged and popular girl, the beautiful Homecoming Queen and centre of everyone’s attention, she is vain and self-centred. And the main characters find true love, but don’t find any self-awareness or gain any emotional maturity by the story’s end.